I have been a public speaker for 15 years, a professional one for over 13, and found this book very useful. I learned several things while reading it, including many things I am doing wrong! Based on the advice in the book, I am going to use some of the techniques at my two talks at VSLive in Redmond next week. The book is a fun read with lots of checklists, sidebars, illustrations, and to do lists. Kristin even quizzes you at the end of each chapter, often using the techniques she demonstrated in the chapter, a brilliant way to reinforce the points! She stresses energy and engagement with the audience and also makes you think of the small things (the side of the stage you walk in on, passive v active voice, using inclusive language, etc) and how they effect the mindset of the audience. 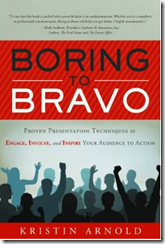 If you want to be a more engaging, dynamic speaker, read this book!